Roster set for tomorrow. We shall see what happens. Nice win, JJ at Texas who would have thunk it! it's even better if it's used on ya..
StAugustineFL wrote: Test from my phone. this has been a failed test of the emergency broadcast AUG system.In the case of an actual emergency you would be dead. One for everyone but me. 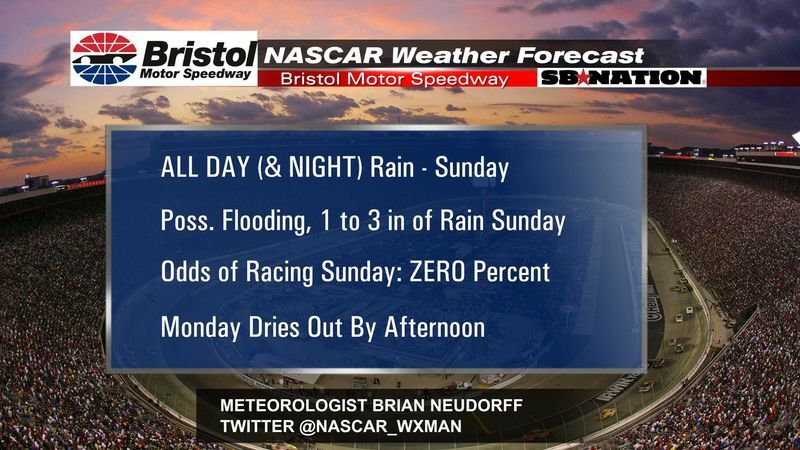 It is going to be a wet day at Bristol Motor Speedway Sunday for the Monster Energy Cup Series Food City 500. Storm system will continue to spread moisture and rain over eastern Tennessee all day and night Sunday. An additional one to three inches of rain is possible in eastern Tennessee with flash flood watches and well as flood advisories in place for the day. My prediction for the odds of racing at Bristol Motor Speedway Sunday is ZERO! I’m calling this one a washout. I should have done this Saturday, but sometimes the fan in me likes to hold out hope, even only giving a 10-percent chance. The good news is the current storm system that is bringing all this rain will start to clear out late Monday morning or early afternoon, though there is still a chance of rain Monday and mostly in the morning. 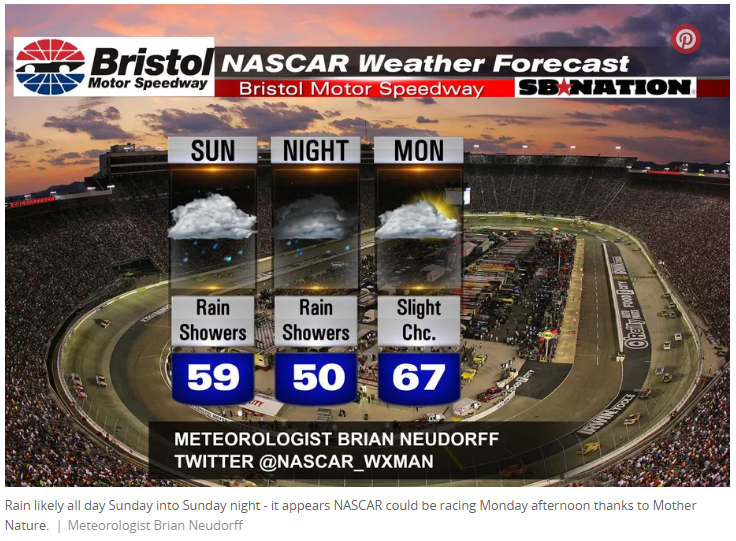 The forecast looks good enough to get racing in if and when the Food City 500 is postponed by NASCAR. If it is postponed, NASCAR will run the race at 1 p.m. ET on FOX. The odds of racing Monday should be around 60 percent. Please follow me on Twitter @NASCAR_WXMAN and like me on Facebook for the latest NASCAR weather updates. What will Rooster do with an open spot on her roster next year??? I saw wind of that earlier before the salt mine absorbed me for the duration. He'll be missed by many but good on him for getting out early. I suspect memories of Dale Sr must have been weighing on him in the back of his mind. 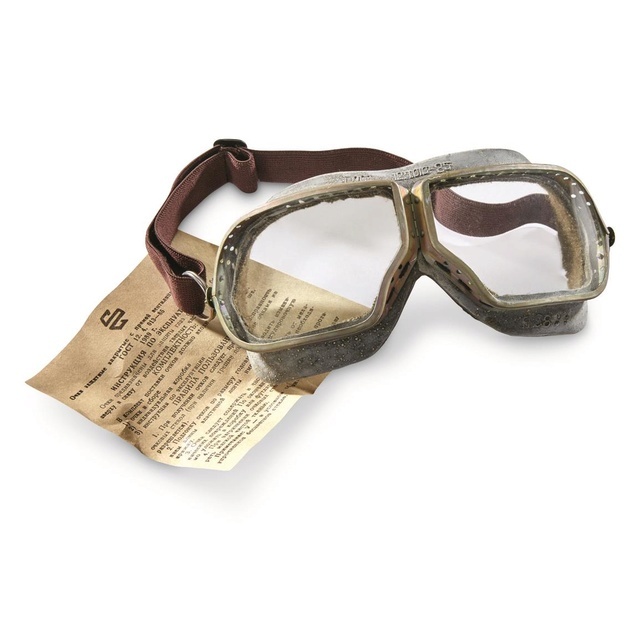 I'll only need them to protect my eyes from insects as I run out front. How'd those work out for y'all???? Don't get me started....... BS call at the end. KyBu had Logano in his sights then the STOOPID penalty. Nice win though san. You will need those points before said and done! 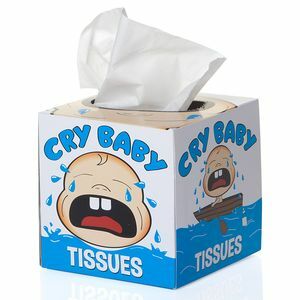 LOL... here ya go Aug! Off topic but this kids dad is an IDIOT. $500 for a pair of shoes? The kid was a star in college at UCLA but hasn't even been drafted by the NBA yet. He will but that's not the point. Longtime NBA legends such as Michael Jordan and Lebron James sell their shoe brand for sub $200 and some dude not even in the league yet (could be a star of a flop) is selling his for $500??? Anyone who buys is a tool. And the big brands (Nike, Adidas, etc) wanted nothing to do with this so they are going alone. That's insane Aug! He has a large set of cajones to think that HIS shoes should be going for that much and he's not even a proven pro start! He is well on his way to having a "come get me" target on his back when he gets on the court to start his pro career. I think his dad is at least half of the problem! Yeah, and a good majority of basketball fans are poor inner-city folks who struggle to put food on the table. Huge disconnect between a silver-spoon fed family and reality. I have no doubt this has failure written all over it. That would not surprise me in the least! Man Allmendinger, you need to know when to BACK OFF. Then in the interview he tried to claim that someone was on his bumper. Not true, Harvick was way off of him. Thank goodness no one hurt. Amazingly! I'm not sure all of it can be laid at the feet of Dinger, but agree that it was amazing that there were no injuries in that wreck! I was happy for Stenhouse, that has to be an amazing feeling to have your first Cup win. Get ready for Kansas - racing under the lights baby!!! Yes, very happy for Stenhouse. Especially living in the Danica shadow. Just making sure you are awake! 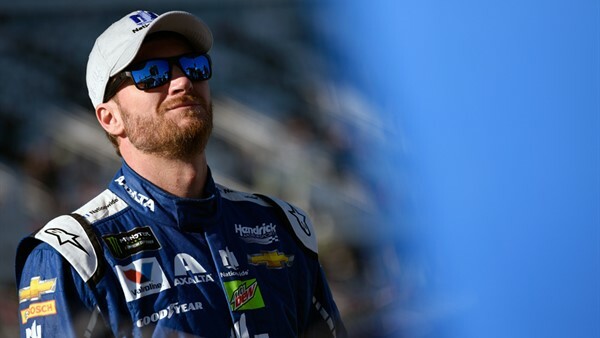 KANSAS CITY, Kan. — Aric Almirola was airlifted to a local hospital after a severe crash late in Saturday night’s Monster Energy NASCAR Cup Series race at Kansas Speedway. Almirola’s Richard Petty Motorsports No. 43 Ford was the third car involved in the multicar stack-up, triggered when a breakage on Joey Logano’s No. 22 forced contact with Danica Patrick’s No. 10 entering Turn 1 on the 1.5-mile track. Both cars hit hard, with Almirola’s entry sliding into the melee, its rear end lifting off the ground. The crash produced a red flag with 200 of the 267 laps complete in the Go Bowling 400, giving safety workers time to extract Almirola by cutting through the roof of his car. The 33-year-old driver was described as alert and awake as he was removed from the car onto a backboard, his neck stabilized by a brace. Logano and Patrick were evaluated and released from the track’s infield care center. The two had a spirited conversation before taking the mandatory ambulance ride to the infield, but Logano explained that an unknown parts failure on his car’s right-front had caused his car to break loose. Patrick was saddled with her fifth failure to finish in 11 races this season. Four of those have been crash-related. Logano’s explanation was small consolation, she said. Hope Almirola is okay. I thought if anyone was going to have an injury, it would have been Danica. Not exactly Nascar, but look at this cute little fella! Saturday’s Minnesota Twins-Cleveland Indians game was put on hold for several minutes when a squirrel decided it wanted to get in on the action. The squirrel first popped up in right field in the bottom of the sixth inning, and then ran across the infield and around the home plate area trying desperately to find an escape route, to the delight of the Progressive Field crowd. The grounds crew then joined in on the fun, trying to chase ol’ Squirrelly out a doorway on the left field line. But the squirrel, perhaps realizing that this was its 15 minutes of fame, went bold and jumped into the stands instead — not content to throw away its shot. All in all, great major-league showing by our bushy-tailed friend. I managed to make it through the entire race. The crash was pretty intense. Cute squirrel but I hope he didn't scratch the heck out of anyone when in the stands. You know the old saying "never back a squirrel into a corner"
in case the first 4 didn't work...secret to voodoo is technique,the more spells the better the odds one may actually work!!! Radar looks good at the moment. Couple of isolated storms but they are miles north of Charlotte and moving east. What a prediction! Not quite what happened and even lower finish, but what a prophet! That really stunk! Chase Elliott is my favorite driver. Unfortunate for Elliott and Keselowski. A few of us are in a Nascar Live fantasy league. San is a diehard Keselowski fan and has him on her team every week. When one of the other members decides to pick him up he usually flames out, lol. If you're interested you should join us next year billsfan. I am more a baseball/football guy but got wrangled into Nascar a few years ago. It's fun and I enjoy the friendly ribbing.